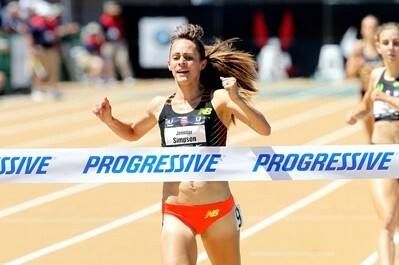 – Jenny Simpson after winning the 1,500 at 2014 USAs when asked if she had any doubt coming in that she would win. LRC Final Day Photo Gallery Now Up! LRC Jenny Simpson Over Mary Cain, But The Talk Is About Morgan Uceny Falling (Again) (updated) Mary Cain put up a fight but Jenny Simpson was too good, yet all anyone could talk about was Morgan Uceny falling again. *Discuss The Fall Here *Watch here. LRC Three Thoughts On The Fall And Duane Solomon’s Dominant 800 Victory At 2014 USAs (updated) There was a big fall, but no one was going to stop Duane Solomon from repeating as champion. 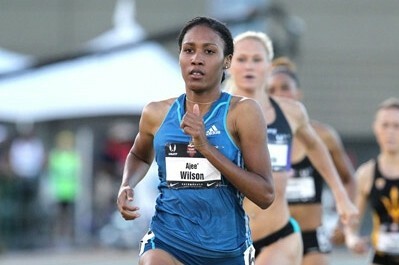 LRC 3 Thoughts On Women’s 800m: Ajee Wilson The Real Deal, Laura Roesler Earns Some $$$, And Brenda Martinez’s “Struggles”(updated) Ajee Wilson is the real deal and Laura Roesler may be as well. Discuss: AJEE MF WILSON – USA CHAMPION!!! LRC Evan Jager Holds Off Training Partner Dan Huling To Win Third Straight Steeple Title Jager has run the steeple three times at USAs and has come away victorious each time. He had to work hard to do it though, as Huling was right with Jager for most of the last lap. 1. 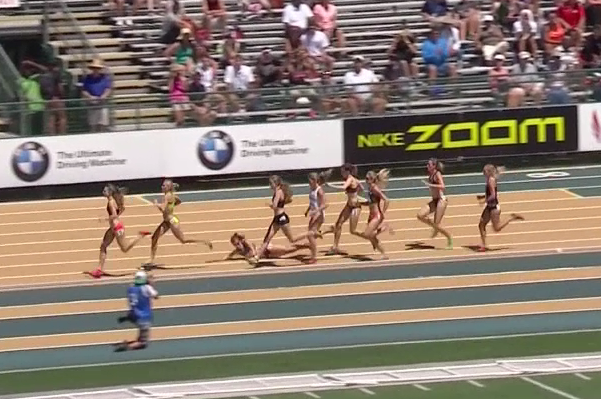 Ok, if there was a DQ in the men’s 800, the has to be one in the women’s 1500 – Bye Bye Mary Cain? 2. CAIN TRIPS UCENY! UNBELIEVABLE! 3. Morgan Uceny Falls Again! *Recovered From Fractured Ankle, Mike Rodgers Is Pumped To Be US 100m Champ Rodgers wanted Maurice Greene‘s 9.91 stadium record but a big wind stopped him. *US Women’s Pole Vault Pioneer Stacy Dragila Watches Jenn Suhr Win Her 6th USA Outdoor Title Article includes good quotes from both. VCB Wins Jamaican 100m In 10.96, Kaliese Spencer Runs W-Leading 53.41 400H Nickel Ashmeade won the men’s 100m in 10.06. Usain Bolt Isn’t At Jamaican Champs But Says He’s Ready For Relay Duty At Commonwealth Games We say put him on the 4 x 400. Two-Time World Champ David Storl PRs With Massive 21.90m Heave Pretty impressive. The WTW is back! 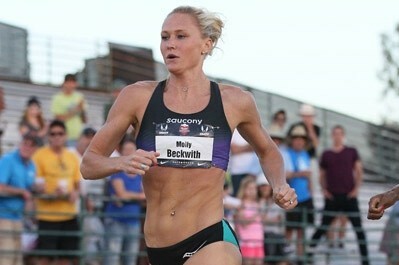 We praise Molly Beckwith-Ludolow, praise the increased competitiveness of women's track, show you just how dominant the SEC and PAC-12 are at NCAAs and make a $10,000 guarantee that Galen Rupp won't set the 10,000 WR. Plus why it's unacceptable for commentators to talk about the weight of female track stars. Taoufik Makhloufi Says He’s A Big Fan Of Mo Farah And Talks About Struggling To Keep Up With Him On Long Runs In Kenya Talking about this season, Makhloufi is hoping for fast times as he wants to get under 3:30 and 1:43. 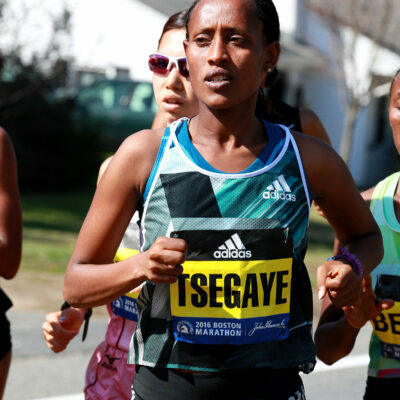 Rita Jeptoo Will Defend Her Title At The 2014 Chicago Marathon Last year she won in 2:19:57 and then won Boston in 2:18:57. IAAF Recap: Oregon Freshman Devon Allen Stuns As U.S. 110 Hurdles Champ In Sacramento Allen ran a slightly wind-aided 13.16 to beat defending champ Ryan Wilson by .005; David Oliver was 3rd. Jeneba Tarmoh (you remember her from the 2012 dead heat fiasco) won the 200 (22.06) as Curtis Mitchell ran 20.13 to beat Wallace Spearmon (20.19). Inika McPherson gets HJ title in 2.00m PR (previous best 1.96m) beating Chaunte Lowe and Brigetta Barrett. 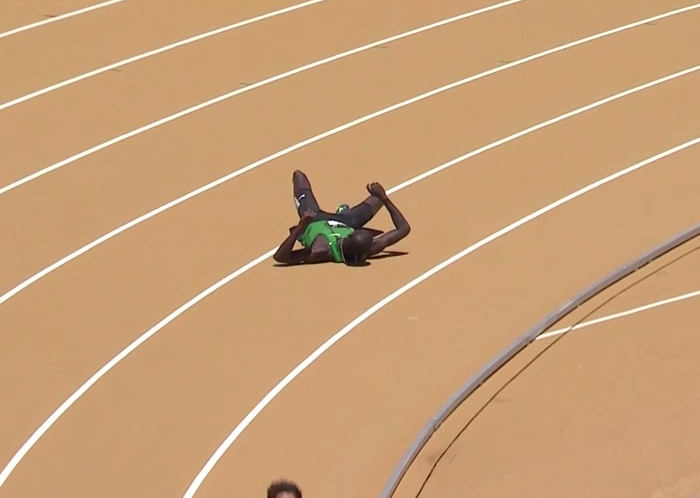 Kori Carter takes 400H as Johnny Dutch wins for the men (48.93). Sam Kendricks won the PV (5.75), Jeffery Henderson the LJ, Gia Lewis-Smallwood the discus and Sean Furey the javelin. Sacramento Bee: New Mom Stephanie Brown Trafton Triumphs In Competing The US record holder finished 4th in the discus after taking last year off to have a baby. OK, How much will Laura Roesler sign for( Yearly) with Nike. OK all things aside, Why the hell is Track and Field so UNPOPULAR? Where are the Fans at Sacramento? 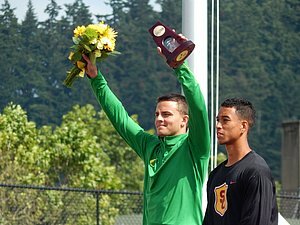 LRC Men’s 1,500: Leo Manzano Comes Through When It Counts Again, Wins Second Outdoor 1,500 Title (updated) Manzano proved once again that he’s a different animal in championship races and used a strong last 100 to pull away from second-place Pat Casey for the win. 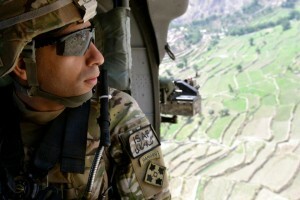 *MB: Manzano is the man! 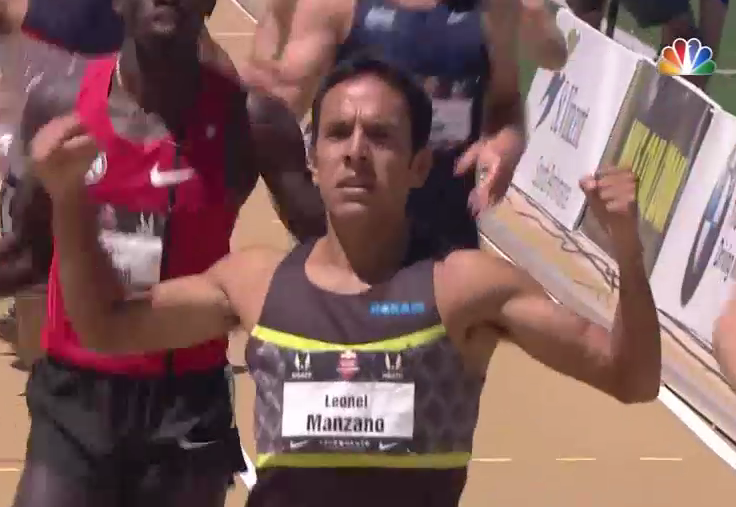 LRC Leo Manzano’s Amazing USATF Championship Record Nine USA meets for Leo in his life, nine top 3 finishes. 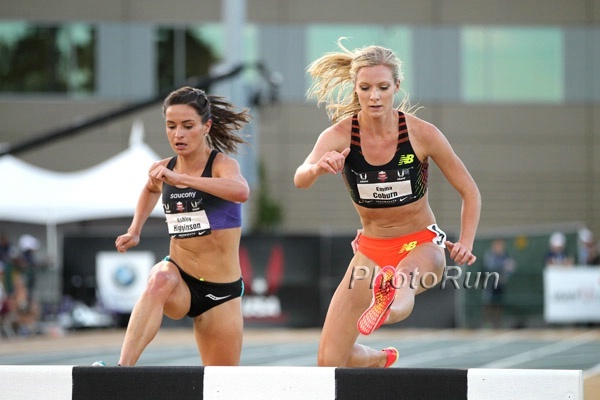 LRC Women’s Steeple: Emma Coburn Breaks Meet Record to Win 3rd U.S. Title Coburn ran a very impressive 9:19 in 84-degree heat and now owns three of the top six times in the world this year. Ashley Higginson ran a big PR of 9:27 for second. 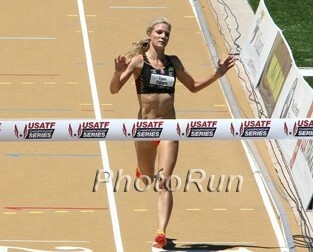 RRW Emma Coburn Sets USATF Steeplechase Meet Record, Leo The Lion Captures His 2nd 1,500 Title Race Results Weekly recap. Former Texas Tech Star Gil Roberts Wins USA 400 And Gets Some Love From His Alma Mater Newspaper His former coach said it was great for Roberts, who has been injured a lot the past two years. LRC Men’s 10,000: The Race Goes According To Form As Galen Rupp Kicks Away From Chris Derrick In The Last Lap To Win His 6th US 10,000m Title As expected, Rupp was dominant over the final 400 and easily won over Derrick in 28:12. 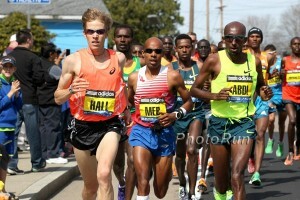 Behind them the best of the rest was 2:10:57 marathoner Ryan Vail, who had a big kick to get 3rd. 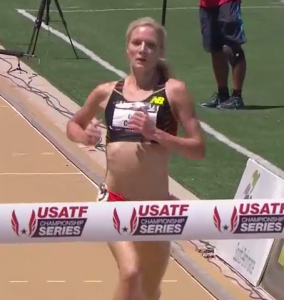 LRC Women’s Steeple Semis: All The Big Names Through Bridget Franek and Emma Coburn won their respective heats, both in 9:39. After the race, we spoke with Coburn as well as Stephanie Garcia, who recently set a PR by 13 seconds. 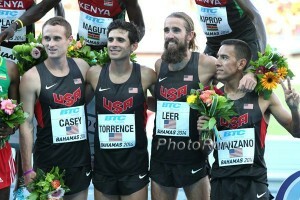 LRC Men’s 1,500 Semis: David Torrence Goes Home Early – Leo, Lopez, Leer And Casey All Advance David Torrence‘s first USAs under new coach Jama Aden turned into a nightmare, but it was a great night for a number of underdogs like Ford Palmer who find themselves in the USA final. 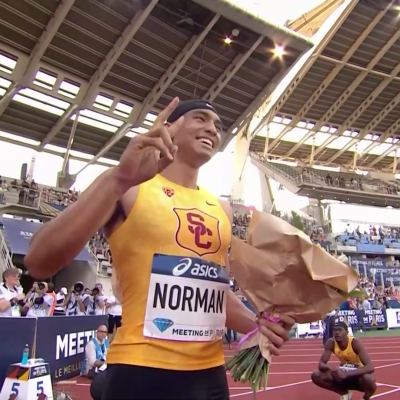 Instant Analysis 3 Thoughts On The Men’s And Women’s 800 Heats: A Very Pregnant Alysia Montaño, The Group Of Death, And The Favorites Move On (Mostly) The track action at 2014 USAs is underway and the 800 heats are in the books. Get our instant analysis of the heats which included a very pregnant competitor. MB: WTF is Montano doing on the start line?! 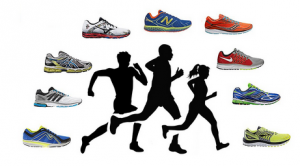 LRC 800 Post-Race Reactions: The Athletes Talk About Their Races Post-race reaction from Chanelle Price, Ajee Wilson, Brenda Martinez, Phoebe Wright, Lea Wallace, Laura Roesler, Charles Jock, Cas Loxsom, Robby Andrews, Sam Ellison and Duane Solomon. Sac Bee Day 2 Recap USA javelin record holder Kara Patterson won her fifth outdoor national title in a showdown with Brittany Borman as they became the first two American women to go over 200 feet in the same meet, Amanda Smock won the triple jump, Kibwe Johnson won his third USA hammer title in four years. 1968 Heroes Tommie Smith And John Carlos Were In Attendance As was 1964 icon Billy Mills, whom we spoke with at length. IAAF Recap Of Kenyan Trials For World Junior Champs: Defending Junior Gold Medalist Alfred Kipketer Wins 800 In 1:45.67 Leading Wire-To-Wire Titus Kipyego, a relative of three-time World champion Vivian Cheruiyot, won the steeple (8:22) as Rosefline Chepngetich won the women’s in 9:43. Moses Mukono took the men’s 5,000 (13:46) Elvis Cheboi the 10,000 (28:33). Recap Of Paavo Nurmi Games In Turku, Finland: Olympic Champ Krisztian Pars Stays Keeps Winning Streak Going With 79.83 Hammer As Throws Highlight Kenya’s Elijah Manangoi won the 1,500 in 3:38.99; Finland’s Sandra Eriksson won the 3,000m in an 8:55.13. 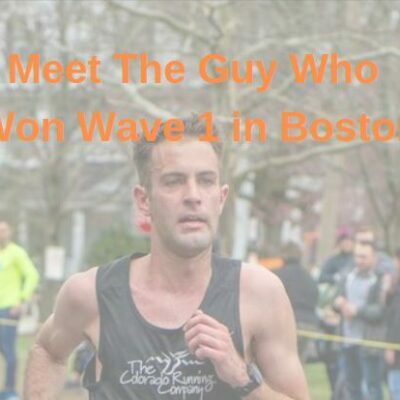 Meet Co-Director Thinks Sacramento Is A Better Track Town Than Eugene In 2000 and 2004, they drew larger crowds than Eugene did in 2008 and 2012, and he thinks the weather is better as well. 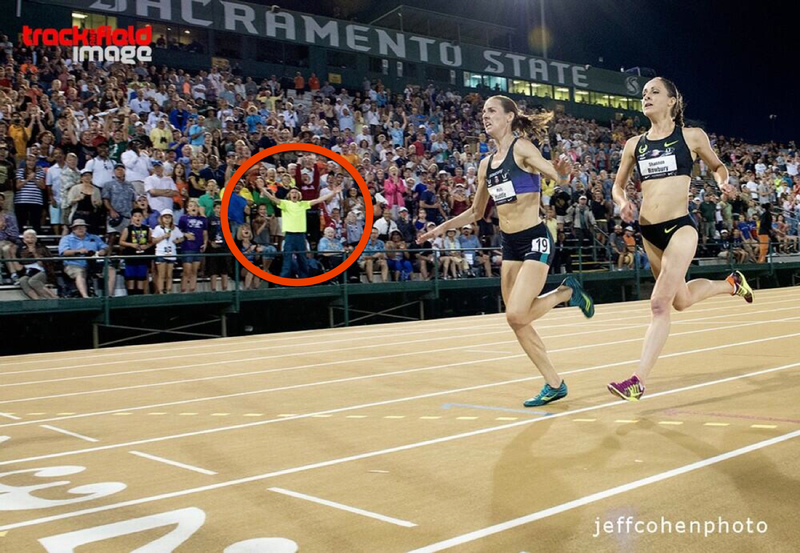 Discuss: Sacramento: We’re a better track town than Eugene – we just don’t have the Nike money. 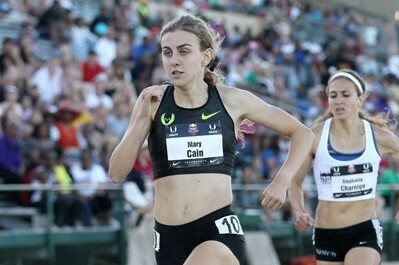 Mary Cain Is Ready For USAs And Life As A Real Pro – Not A HSer Who Is Pro She reveals her goal is sub-4 for the year. 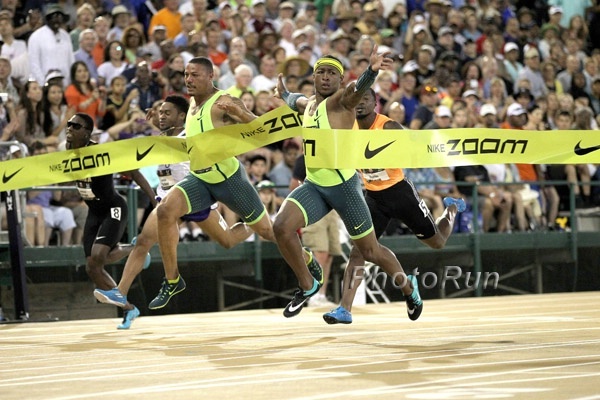 With No Gatlin Or Gay, Might It Be Ryan Bailey Who Wins 100m At USAs? Bailey, who got the baton right next to Bolt in 2012, is on the comeback trail from injury. 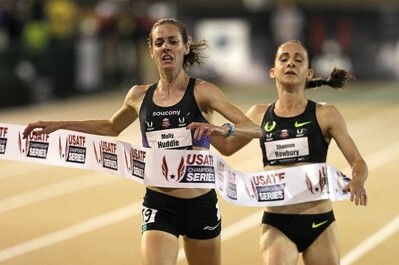 Shanon Rowbury should have been DQ'd from the 5000. What happened to Brianna Rollins this year? 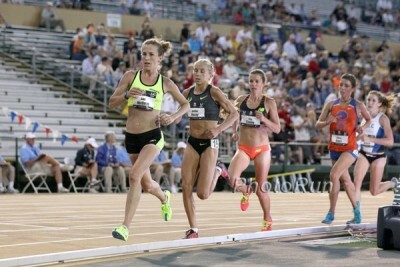 LRC What A Race: Molly Huddle Triumphs Over A Brave Effort From Shannon Rowbury In 2014 USATF 5,000 Huddle and Rowbury waged an epic battle to the line with Huddle prevailing in 15:01.56 to Rowbury’s 15:01.71. NCAA champion Marielle Hall was 3rd as Stanford’s Aisling Cuffe was 4th. MB: Shanon Rowbury should have been DQ’d from the 5000. What do you think? Watch the video and tell us what you think. 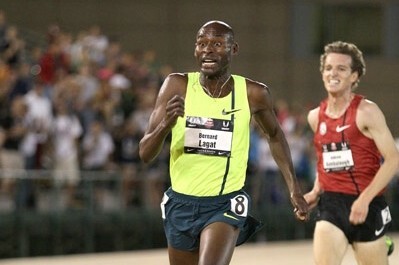 LRC Bernard Lagat, At Age 39, Wins His Seventh USA Men’s 5,000 Title – Two Quick Thoughts + Lots Of Post-Race Talk Lagat got the job done yet again as expected since Galen Rupp wasn’t in the field. Or was he? 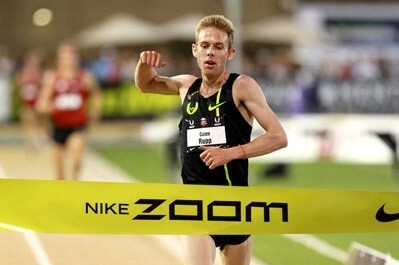 *Goe: Andrew Bumbalough does everything but win the men’s 5,000 final “You always know he’s coming,” Bumbalough said. LRC Men’s 800 Semis: The Big Boys – Solomon, Greer, Sowinski – Advance To Set Up A Great Final A great final with Duane Solomon, Erik Sowinski, Elijah Greer, RobbyAndrews, Cas Loxsom and others is all set, but we’re still wondering about a questionable DQ of Nick Hartle. LRC 800 Semifinals 2014 USA Nationals: Chanelle Price Scratches, Ajee Wilson Impresses, And So Does Laura Roesler The future looks very bright for Laura Roesler, who won her heat ahead of Brenda Martinez. If you believe that, then remember Ajee Wilson is two years and five months younger. LRC Steeplechase Semifinals Go According To Form: Andy Bayer Still Learning, Ben Bruce Wins 3.5 Weeks After A Marathon Recap, results, post-race interviews. 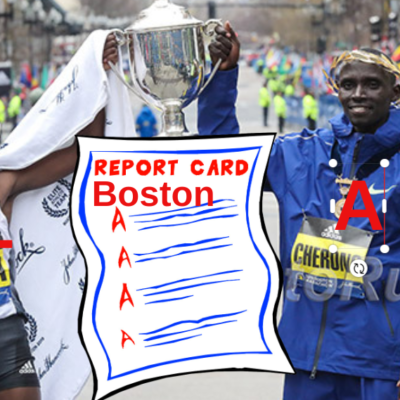 *Women’s Steeple: Mr. 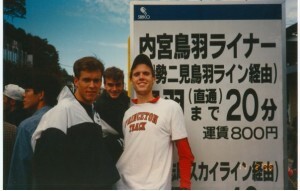 Mom: Alan Webb Took Over Child Care Duties So His Wife Julia Could Compete In Steeple She failed to make the final. 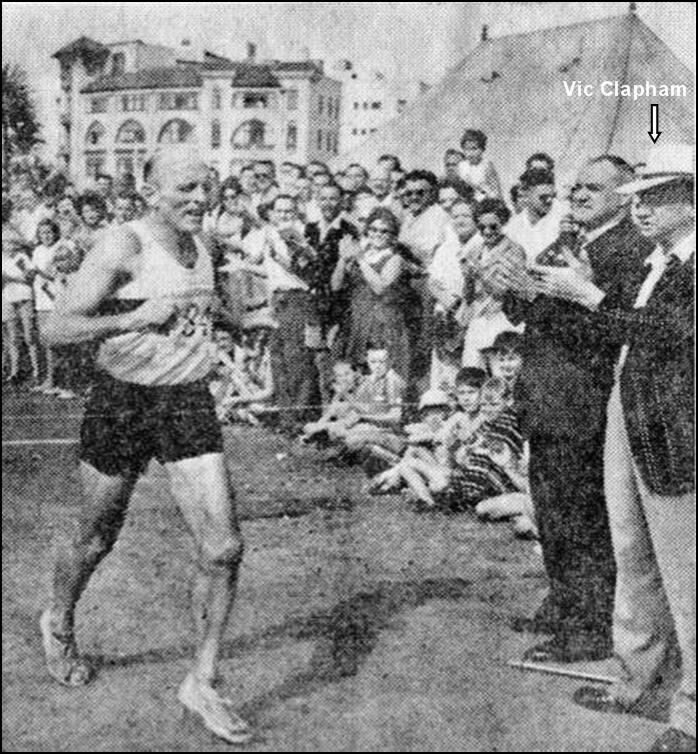 Who’s The Greatest American 10,000-Meter Male Runner Of Them All? Rupp, Mills Or Shorter? Now that was a 5000 – Huddle over Rowbury at the line!!! Molly MF HUDDLE! !!!! Pulling a STEVE JONES!!!!! Rowbury and Hasay got owned in the same way, comical and awesome! Bet You Didn’t Think You’d See This On LetsRun Alysia Montano Pregnant 800m Photo Gallery We had a TV station in LA call us about our interview with Alysia from last night. 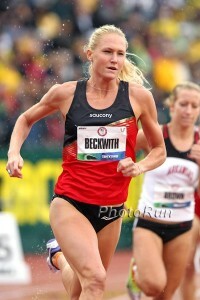 How will Rupp respond to the BBC/ProPublica allegations at USAs? 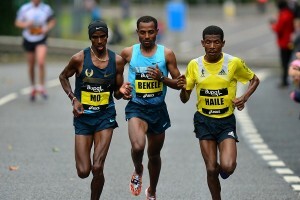 Ryan Hall, Sara Hall And Lauren Fleshman Will Race Napa To Sonoma Half Marathon On July 20th Hall faces 4-time defending champ and CR holder (1:02:38) Tesfaye Alemayehu. 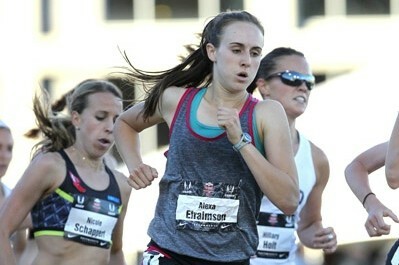 Fleshman is making her half marathon debut. Apparently Meb Keflezighi and Mary Decker Slaney will lead the races on an ElliptiGO. Asafa Powell Will Race At Paris DL Meet On July 5th Days Before His Drug Hearing With CAS As previously announced, he and Sherone Simpson are free to compete pending the outcome of their trial.